Dr. William Glasser was one of the theorist who I studied in graduate school while perusing my Masters of Education degree in Mental Health Counseling at Lindsey Wilson College (Ashland, Kentucky campus) during the 2010 to 2012 time period. Glasser is the founder of Reality Therapy and Choice Theory. I felt fortunate to have found a used copy of Glasser’s (2003) book, For Parents and Teens at a used book sale for only one dollar. What a lucky find. I decided to buy it, read it, and write this book review for you. I’ve worked as a mental health practitioner, providing services for children and teens and their families since 2002. The majority of these children and teens are in Psychiatric Residential Treatment Facilities. I’ve had some experience assisting with children and teens who are for psychiatric acute-care needs. I’m still learning and growing as a practitioner. I don’t consider myself to be an expert in this area yet, despite having an advanced degrees and 16+ years of experience. Naturally, I want to continue learning how to bring about the best outcomes for this age group. I read Glasser’s book to learn more. 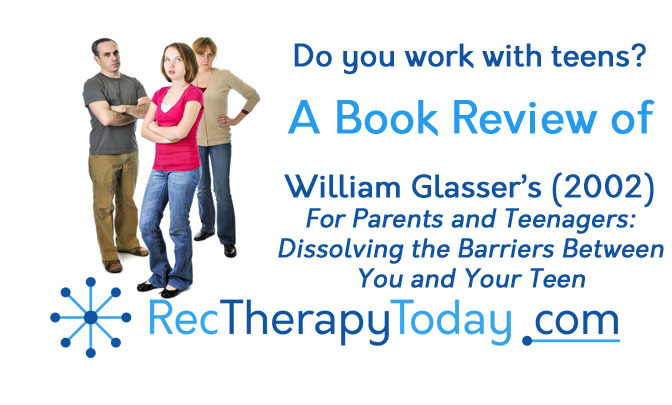 Dr. Glasser is a psychiatrist who has assisted with healing family relationships. Glasser is against the so-called standard approach of forcing and controlling teens to gain compliance. Glasser argues that a controlling approach isn’t effective and is at worst counterproductive. Glasser book is aimed at helping parents to build healthier, effective, relationships with their teen. Glasser reminds us that we’re only able to change one person (and that is ourselves). We can’t change teens. Glasser discusses ways to change ourselves that are more likely to build a stronger, effective relationship with the teen. This approach is more likely to get better outcomes from your teen. Tip # 1: Trying to change your teen will cause unhappiness. Change yourself. Glasser (2013) argues that the unhappiness is the only true human problem. People are either happy or unhappy. What causes unhappiness? Glasser argues, the most miserable are those who are always trying to control others, (p. 16).” Controlling others doesn’t work. It’s ineffective. Despite being ineffective, it brings unhappiness, and, “almost all chronic illness has a lot to do with unhappiness.” Gasser reminds us to give up forcing others to change. Change the only person who you have power to change and that is ourselves. You might feel a sense of relief when you radically accept that you’re not able to change your teens. Example: trying to change the weather or your teen impossible. Trying to change either will only cause unhappiness. We can change ourselves. We can change and prepare for things outside of our control. We prepare for weather. Prepare for teens. Tip # 2: How to prepare for your teen. External control is limited. Develop self-control. External control is limited. Think of the cliché saying, “When the cat is away, the mice will play.” External control is a lot like that. It works best when the controller is there to force it. However, it quickly stops when the controller is not there. Glasser (2013) discussed seven (7) external controlling behaviors that destroy a relationship with a teen. These include: “criticizing, blaming, complaining, nagging, threatening, punishing and rewarding to control.” Do any of those those behaviors if you want to push the teen away from you. Self-control is the direct opposite of external control. Self-control is far more effective. This approach is self-descriptive. It consists of a person controlling themselves. A person with self-control can be trusted to do the right thing (even when the cat is away). The parent can only control herself (or himself). The child can only control herself (or himself). Tip #3: Build a strong relationship (with trust) to encourage your child to make mature choices (even when you’re not around). It will take time and patience to develop this type of relationship. Tip # 4: Teens are already motivated without the use of external control. Glasser (2013) argues that people are already motivated by pain and pleasure. People want to avoid pain and experience pleasure. Your teen is no different. The controlling approach attempts to get compliance by adding pain (nagging, grounding, consequences) when the controller is uphappy with the teen’s behavior. The controller attempts to get compliance by adding pleasure (rewards, praise, benefits) when the controller is happy with what the child is doing. What happens when the child is no longer happy with the rewards you’re able to give? A different approach is to remember the teen is already motivated. The teen isn’t going to do anything to purposely cause herself to experience pain. The better approach is to develop the best possible relationship with your child and express your honest, authentic thoughts and concerns about their well-being. Provide education about the potential harms and ask them what you want them to do. Glasser argued that “recreation is the world’s biggest business.” People spend a lot of money to experience fun. The secret to helping a teen learn is making it fun. Help them to enjoy learning. A parent cares about the well-being of their child. They want what is best for their child. There are two approaches. An infective approach is to make it miserable for the child by giving a nagging lecture, criticizing the child’s faults, and having extreme consequences. This approach isn’t fun. The child might go along with you or the child may rebel. An effective approach is to make it fun and enjoyable. Let the child know you care about them. You’ve got a great relationship with them (that makes both you and the child) feel happy. Listen to their concerns first. Support them in their endeavors (which is their pursuit of happiness). Encourage them to make the best choices possible. Any parent who has teens could benefit from reading this book. Anyone who provides services for teens like recreation therapists, teachers, counselors, and coaches could benefit from reading this book as well. Want to Learn More and Earn CEUs too? Danny Pettry offers several self-study CEU courses for Rec Therapists. One course is on Dr. Glasser’s Choice Theory and there several on helping children and teens.